For other uses, see Tritone (disambiguation). In music theory, the tritone is defined as a musical interval composed of three adjacent whole tones. For instance, the interval from F up to the B above it (in short, F–B) is a tritone as it can be decomposed into the three adjacent whole tones F–G, G–A, and A–B. According to this definition, within a diatonic scale there is only one tritone for each octave. For instance, the above-mentioned interval F–B is the only tritone formed from the notes of the C major scale. A tritone is also commonly defined as an interval spanning six semitones. According to this definition, a diatonic scale contains two tritones for each octave. For instance, the above-mentioned C major scale contains the tritones F–B (from F to the B above it, also called augmented fourth) and B–F (from B to the F above it, also called diminished fifth, semidiapente, or semitritonus). In twelve-equal temperament, the tritone divides the octave exactly in half. In classical music, the tritone is a harmonic and melodic dissonance and is important in the study of musical harmony. The tritone can be used to avoid traditional tonality: "Any tendency for a tonality to emerge may be avoided by introducing a note three whole tones distant from the key note of that tonality." Contrarily, the tritone found in the dominant seventh chord helps establish the tonality of a composition. These contrasting uses exhibit the flexibility, ubiquity, and distinctness of the tritone in music. The condition of having tritones is called tritonia; that of having no tritones is atritonia. A musical scale or chord containing tritones is called tritonic; one without tritones is atritonic. Play in equal temperament (help·info). Full ascending and descending chromatic scale on C, with tritone above each pitch. Pairs of tritones that are inversions of each other are marked below. The augmented fourth between C and F♯ and the diminished fifth between C and G♭ are enharmonically equivalent intervals. Both are 600 cents wide in 12-TET. Since a chromatic scale is formed by 12 pitches (each a semitone apart from its neighbors), it contains 12 distinct tritones, each starting from a different pitch and spanning six semitones. According to a complex but widely used naming convention, six of them are classified as augmented fourths, and the other six as diminished fifths. Under that convention, a fourth is an interval encompassing four staff positions, while a fifth encompasses five staff positions (see interval number for more details). The augmented fourth (A4) and diminished fifth (d5) are defined as the intervals produced by widening the perfect fourth and narrowing the perfect fifth by one chromatic semitone. They both span six semitones, and they are the inverse of each other, meaning that their sum is exactly equal to one perfect octave (A4 + d5 = P8). In twelve-tone equal temperament, the most commonly used tuning system, the A4 is equivalent to a d5, as both have the size of exactly half an octave. In most other tuning systems, they are not equivalent, and neither is exactly equal to half an octave. Any augmented fourth can be decomposed into three whole tones. For instance, the interval F–B is an augmented fourth and can be decomposed into the three adjacent whole tones F–G, G–A, and A–B. 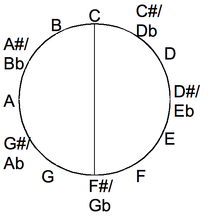 B–C (minor second), C–D (major second), D–E (major second), and E–F (minor second). B–C♯ (major second), C♯–D♯ (major second), D♯–E♯ (major second), and E♯–F♮ (diminished second). Notice that the latter diminished second is formed by two enharmonically equivalent notes (E♯ and F♮). On a piano keyboard, these notes are produced by the same key. However, in the above-mentioned naming convention, they are considered different notes, as they are written on different staff positions and have different diatonic functions within music theory. Tritone drawn in the chromatic circle. This definition, however, has two different interpretations (broad and strict). TT = T+T+T = S+S+S+S+S+S. According to this definition, with the twelve notes of a chromatic scale it is possible to define twelve different tritones, each starting from a different note and ending six notes above it. Although all of them span six semitones, six of them are classified as augmented fourths, and the other six as diminished fifths. Within a diatonic scale, whole tones are always formed by adjacent notes (such as C and D) and therefore they are regarded as incomposite intervals. In other words, they cannot be divided into smaller intervals. Consequently, in this context the above-mentioned "decomposition" of the tritone into six semitones is typically not allowed. If a diatonic scale is used, with its 7 notes it is possible to form only one sequence of three adjacent whole tones (T+T+T). This interval is an A4. For instance, in the C major diatonic scale (C–D–E–F–G–A–B–...), the only tritone is from F to B. It is a tritone because F–G, G–A, and A–B are three adjacent whole tones. It is a fourth because the notes from F to B are four (F, G, A, B). It is augmented (i.e., widened) because it is wider than most of the fourths found in the scale (they are perfect fourths). For instance, in the C major diatonic scale, the only d5 is from B to F. It is a fifth because the notes from B to F are five (B, C, D, E, F). It is diminished (i.e. narrowed) because it is smaller than most of the fifths found in the scale (they are perfect fifths). Play 45:32 (590.22 cents) (help·info). Play 729:512 (611.73 cents) (help·info). Play 7:5 (582.51 cents) (help·info). play (help·info)). The inverse of 600 cents is 600 cents. Thus, in this tuning system, the A4 and its inverse (d5) are equivalent. The half-octave or equal tempered A4 and d5 are unique in being equal to their own inverse (each to the other). In other meantone tuning systems, besides 12-tone equal temperament, A4 and d5 are distinct intervals because neither is exactly half an octave. In any meantone tuning near to ​2⁄9-comma meantone the A4 is near to the ratio 7:5 (582.51) and the d5 to 10:7 (617.49), which is what these intervals are in septimal meantone temperament. In 31 equal temperament, for example, the A4 is 619.35 cents, whereas the d5 is 580.65 cents. This is perceptually indistinguishable from septimal meantone temperament. A4 + d5 = P8. A4 + A4 = P8. A4 + A4 = P8 − diesis. Play (help·info) or 36:25. The 64:45 just diminished fifth arises in the C major scale between B and F, consequently the 45:32 augmented fourth arises between F and B. These ratios are not in all contexts regarded as strictly just but they are the justest possible in 5-limit tuning. 7-limit tuning allows for the justest possible ratios (ratios with the smallest numerator and denominator), namely 7:5 for the A4 (about 582.5 cents, also known as septimal tritone) and 10:7 for the d5 (about 617.5 cents, also known as Euler's tritone). These ratios are more consonant than 17:12 (about 603.0 cents) and 24:17 (about 597.0 cents), which can be obtained in 17-limit tuning, yet the latter are also fairly common, as they are closer to the equal-tempered value of 600 cents. Eleventh harmonic between C and F↑. 4 above C1), known as the lesser undecimal tritone or undecimal semi-augmented fourth, is found in some just tunings and on many instruments. For example, very long alphorns may reach the twelfth harmonic and transcriptions of their music usually show the eleventh harmonic sharp (F♯ above C, for example), as in Brahms's First Symphony. This note is often corrected to 4:3 on the natural horn in just intonation or Pythagorean tunings, but the pure eleventh harmonic was used in pieces including Britten's Serenade for tenor, horn and strings. Ivan Wyschnegradsky considered the major fourth a good approximation of the eleventh harmonic. Use of the eleventh harmonic in the prologue to Britten's Serenade for tenor, horn and strings. The unstable character of the tritone sets it apart, as discussed in  [Paul Hindemith. The Craft of Musical Composition, Book I. Associated Music Publishers, New York, 1945]. It can be expressed as a ratio by compounding suitable superparticular ratios. Whether it is assigned the ratio 64/45 or 45/32, depending on the musical context, or indeed some other ratio, it is not superparticular, which is in keeping with its unique role in music. Although this ratio [45/32] is composed of numbers which are multiples of 5 or under, they are excessively large for a 5-limit scale, and are sufficient justification, either in this form or as the tempered "tritone", for the epithet "diabolic", which has been used to characterize the interval. This is a case where, because of the largeness of the numbers, none but a temperament-perverted ear could possibly prefer 45/32 to a small-number interval of about the same width. In the Pythagorean ratio 81/64 both numbers are multiples of 3 or under, yet because of their excessive largeness the ear certainly prefers 5/4 for this approximate degree, even though it involves a prime number higher than 3. In the case of the 45/32, 'tritone' our theorists have gone around their elbows to reach their thumbs, which could have been reached simply and directly and non-'diabolically' via number 7. The augmented fourth (A4) occurs naturally between the fourth and seventh scale degrees of the major scale (for example, from F to B in the key of C major). It is also present in the natural minor scale as the interval formed between the second and sixth scale degrees (for example, from D to A♭ in the key of C minor). The melodic minor scale, having two forms, presents a tritone in different locations when ascending and descending (when the scale ascends, the tritone appears between the third and sixth scale degrees and the fourth and seventh scale degrees, and when the scale descends, the tritone appears between the second and sixth scale degrees). Supertonic chords using the notes from the natural minor mode thus contain a tritone, regardless of inversion. Containing tritones, these scales are tritonic. The dominant seventh chord in root position contains a diminished fifth (tritone) within its pitch construction: it occurs between the third and seventh above the root. In addition, augmented sixth chords, some of which are enharmonic to dominant seventh chords, contain tritones spelled as augmented fourths (for example, the German sixth, from A to D♯ in the key of A minor); the French sixth chord can be viewed as a superposition of two tritones a major second apart. The diminished triad also contains a tritone in its construction, deriving its name from the diminished-fifth interval (i.e. a tritone). The half-diminished seventh chord contains the same tritone, while the fully diminished seventh chord is made up of two superposed tritones a minor third apart. Other chords built on these, such as ninth chords, often include tritones (as diminished fifths). In all of the sonorities mentioned above, used in functional harmonic analysis, the tritone pushes towards resolution, generally resolving by step in contrary motion. This determines the resolution of chords containing tritones. The augmented fourth resolves outward to a minor or major sixth (the first measure below). The inversion of this, a diminished fifth, resolves inward to a major or minor third (the second measure below). The diminished fifth is often called a tritone in modern tonal theory, but functionally and notationally it can only resolve inwards as a diminished fifth and is therefore not reckoned a tritone—that is, an interval composed of three adjacent whole tones—in mid-renaissance (early 16th-century) music theory. The half-octave tritone interval is used in the musical/auditory illusion known as the tritone paradox. The theme that opens Claude Debussy's Prélude à l'après-midi d'un faune outlines the tritone between C♯ and G.
The tritone is a restless interval, classed as a dissonance in Western music from the early Middle Ages through to the end of the common practice period. This interval was frequently avoided in medieval ecclesiastical singing because of its dissonant quality. The first explicit prohibition of it seems to occur with the development of Guido of Arezzo's hexachordal system, who suggested that rather than make B♭ a diatonic note, the hexachord be moved and based on C to avoid the F–B tritone altogether. Later theorists such as Ugolino d'Orvieto and Tinctoris advocated for the inclusion of B♭. From then until the end of the Renaissance the tritone was regarded as an unstable interval and rejected as a consonance by most theorists. It seems first to have been designated as a "dangerous" interval when Guido of Arezzo developed his system of hexachords and with the introduction of B flat as a diatonic note, at much the same time acquiring its nickname of "Diabolus in Musica" ("the devil in music"). That original symbolic association with the devil and its avoidance led to Western cultural convention seeing the tritone as suggesting "evil" in music. However, stories that singers were excommunicated or otherwise punished by the Church for invoking this interval are likely fanciful. At any rate, avoidance of the interval for musical reasons has a long history, stretching back to the parallel organum of the Musica Enchiriadis. In all these expressions, including the commonly cited "mi contra fa est diabolus in musica", the "mi" and "fa" refer to notes from two adjacent hexachords. For instance, in the tritone B–F, B would be "mi", that is the third scale degree in the "hard" hexachord beginning on G, while F would be "fa", that is the fourth scale degree in the "natural" hexachord beginning on C.
Later, with the rise of the Baroque and Classical music era, composers accepted the tritone, but used it in a specific, controlled way—notably through the principle of the tension-release mechanism of the tonal system. In that system (which is the fundamental musical grammar of Baroque and Classical music), the tritone is one of the defining intervals of the dominant-seventh chord and two tritones separated by a minor third give the fully diminished seventh chord its characteristic sound. In minor, the diminished triad (comprising two minor thirds, which together add up to a tritone) appears on the second scale degree—and thus features prominently in the progression iio–V–i. Often, the inversion iio6 is used to move the tritone to the inner voices as this allows for stepwise motion in the bass to the dominant root. In three-part counterpoint, free use of the diminished triad in first inversion is permitted, as this eliminates the tritone relation to the bass. —or Wagner's use of timpani tuned to C and F♯ to convey a brooding atmosphere at the start of the second act of the opera Siegfried. In his early cantata La Damoiselle élue, Debussy uses a tritone to convey the words of the poem by Dante Gabriel Rossetti. The tritone was also exploited heavily in that period as an interval of modulation for its ability to evoke a strong reaction by moving quickly to distantly related keys. Later, in twelve-tone music, serialism, and other 20th century compositional idioms, composers considered it a neutral interval. In some analyses of the works of 20th century composers, the tritone plays an important structural role; perhaps the most cited is the axis system, proposed by Ernő Lendvai, in his analysis of the use of tonality in the music of Béla Bartók. Tritone relations are also important in the music of George Crumb and Benjamin Britten, whose War Requiem features a tritone between C and F♯ as a recurring motif. John Bridcut (2010, p. 271) describes the power of the interval in creating the sombre and ambiguous opening of the War Requiem: "The idea that the chorus and orchestra are confident in their wrong-headed piety is repeatedly disputed by the music. From the instability of the opening tritone—that unsettling interval between C and F sharp—accompanied by the tolling of warning bells … eventually resolves into a major chord for the arrival of the boys singing 'Te decet hymnus'." George Harrison uses tritones on the downbeats of the opening phrases of the Beatles songs "The Inner Light", "Blue Jay Way" and "Within You Without You", creating a prolonged sense of suspended resolution. Perhaps the most striking use of the interval in rock music of the late 1960s can be found in Jimi Hendrix's song "Purple Haze". According to Dave Moskowitz (2010, p.12), Hendrix "ripped into 'Purple Haze' by beginning the song with the sinister sounding tritone interval creating an opening dissonance, long described as 'The Devil in Music'." Tritone substitution: F♯7 may substitute for C7, and vice versa, because they both share E♮ and B♭/A♯ and due to voice leading considerations. Tritones also became important in the development of jazz tertian harmony, where triads and seventh chords are often expanded to become 9th, 11th, or 13th chords, and the tritone often occurs as a substitute for the naturally occurring interval of the perfect 11th. Since the perfect 11th (i.e. an octave plus perfect fourth) is typically perceived as a dissonance requiring a resolution to a major or minor 10th, chords that expand to the 11th or beyond typically raise the 11th a semitone (thus giving us an augmented or sharp 11th, or an octave plus a tritone from the root of the chord) and present it in conjunction with the perfect 5th of the chord. Also in jazz harmony, the tritone is both part of the dominant chord and its substitute dominant (also known as the sub V chord). Because they share the same tritone, they are possible substitutes for one another. This is known as a tritone substitution. The tritone substitution is one of the most common chord and improvisation devices in jazz. ^ Don Michael Randel (2003). The Harvard Dictionary of Music: Fourth Edition. Harvard University Press. ISBN 0-674-01163-5. ^ E.g., Jacobus Leodiensis, Speculum musicae, Liber secundus, in Jacobi Leodiensis Speculum musicae, edited by Roger Bragard, Corpus Scriptorum de Musica 3/2 ([Rome]: American Institute of Musicology, 1961): 128–31, citations on 192–96, 200, and 229; Jacobus Leodiensis, Speculum musicae, Liber sextus, in Jacobi Leodiensis Speculum musicae, edited by Roger Bragard, Corpus Scriptorum de Musica 3/6 ([Rome]: American Institute of Musicology, 1973): 1-161, citations on 52 and 68; Johannes Torkesey, Declaratio et expositio, London: British Library, Lansdowne 763, ff.89v-94v, citations on f.92r,2–3; Prosdocimus de Beldemandis, Tractatus musice speculative, in D. Raffaello Baralli and Luigi Torri, "Il Trattato di Prosdocimo de' Beldomandi contro il Lucidario di Marchetto da Padova per la prima volta trascritto e illustrato", Rivista Musicale Italiana 20 (1913): 731–62, citations on 732–34. ^ Smith Brindle, Reginald (1966). Serial Composition. Oxford University Press. p. 66. ISBN 0-19-311906-4. ^ Bruce Benward & Marilyn Nadine Saker (2003). Music: In Theory and Practice, Vol. I, seventh edition (Boston: McGraw-Hill), p. 54. ISBN 978-0-07-294262-0. ^ Fonville, John. "Ben Johnston's Extended Just Intonation- A Guide for Interpreters", p. 121–22, Perspectives of New Music, Vol. 29, No. 2 (Summer, 1991), pp. 106–37. ^ a b Partch, Harry. (1974). Genesis of a Music: An Account of a Creative Work, Its Roots and Its Fulfillments, second edition, enlarged (New York: Da Capo Press): p. 69. ISBN 0-306-71597-X (cloth); ISBN 0-306-80106-X (pbk). ^ a b Renold, Maria (2004). Intervals, Scales, Tones and the Concert Pitch C=128Hz, translated from the German by Bevis Stevens, with additional editing by Anna R. Meuss (Forest Row: Temple Lodge): p. 15–16. ISBN 1-902636-46-5. ^ Helmholtz, Hermann von (2005). On the Sensations of Tone as a Physiological Basis for the Theory of Music, p. 457. ISBN 1-4191-7893-8. "Cents in interval: 590, Name of Interval: Just Tritone, Number to an Octave: 2.0. Cents in interval: 612, Name of Interval: Pyth. Tritone, Number to an Octave: 2.0." ^ Haluska , Ján (2003), The Mathematical Theory of Tone Systems, Pure and Applied Mathematics Series 262 (New York: Marcel Dekker; London: Momenta), p. xxiv. ISBN 0-8247-4714-3. "25:18 classic augmented fourth". ^ Haluska (2003), p. xxv. "36/25 classic diminished fifth". ^ Paul, Oscar (1885). A manual of harmony for use in music-schools and seminaries and for self-instruction, p.165. Theodore Baker, trans. G. Schirmer. ^ Haluska (2003). p. xxiii. "7:5 septimal or Huygens' tritone, Bohlen-Pierce fourth", "10:7 Euler's tritone". ^ Strange, Patricia and Patricia, Allen (2001). The contemporary violin: Extended performance techniques, p. 147. ISBN 0-520-22409-4. "...septimal tritone, 10:7; smaller septimal tritone, 7:5;...This list is not exhaustive, even when limited to the first sixteen partials. Consider the very narrow augmented fourth, 13:9....just intonation is not an attempt to generate necessarily consonant intervals." ^ Monelle, Raymond (2006). The Musical Topic: Hunt, Military And Pastoral, p.102. ISBN 9780253347664. ^ Fauvel, John; Flood, Raymond; and Wilson, Robin J. (2006). Music And Mathematics, p.21-22. ISBN 9780199298938. ^ Haluska (2003), p. 286. ^ a b Partch (1974), p. 115. ISBN 0-306-80106-X. ^ Margaret Bent, ""Accidentals, Counterpoint, and Notation in Aaron’s Aggiunta to the Toscanello", Journal of Musicology 12: "Aspects of Musical Language and Culture in the Renaissance: A Birthday Tribute to James Haar" (1994): 306–44. Citation on 308. ^ Drabkin, William. "Tritone". Grove Music Online (subscription access). Oxford Music Online. Retrieved 2008-07-21. ^ Andreas Werckmeister. Harmonologia musica, oder kurze Anleitung zur musicalischen Composition (Frankfurt and Leipzig: Theodor Philipp Calvisius 1702): 6. ^ Andreas Werckmeister, Musicalische Paradoxal-Discourse, oder allgemeine Vorstellungen (Quedlinburg: Theodor Philipp Calvisius, 1707): 75–76. ^ Reinhold, Hammerstein (1974). Diabolus in musica: Studien zur Ikonographie der Musik im Mittelalter. Neue Heidelberger Studien zur Musikwissenschaft (in German). 6. Bern: Francke. p. 7. OCLC 1390982. ...mi contra fa ... welches die alten den Satan in der Music nenneten" "...alten Solmisatores dieses angenehme Intervall mi contra fa oder den Teufel in der Music genannt haben. ^ F. J. Smith, "Some Aspects of the Tritone and the Semitritone in the Speculum Musicae: The Non-Emergence of the Diabolus in Music," Journal of Musicological Research 3 (1979), pp. 63–74, at 70. ^ Jeppesen, Knud (1992) . Counterpoint: the polyphonic vocal style of the sixteenth century. trans. by Glen Haydon, with a new foreword by Alfred Mann. New York: Dover. ISBN 0-486-27036-X. ^ Nichols, R. (1972) Debussy. Oxford University Press. ^ Persichetti, Vincent (1961). Twentieth-century Harmony: Creative Aspects and Practice. New York: W. W. Norton. ISBN 0-393-09539-8. OCLC 398434. ^ Lendvai, Ernő (1971). Béla Bartók: An Analysis of his Music. introd. by Alan Bush. London: Kahn & Averill. pp. 1–16. ISBN 0-900707-04-6. OCLC 240301. ^ "Musical Analysis of the War Requiem". Retrieved 16 March 2016. ^ Bridcut, J. (2010), Essential Britten, a pocket guide for the Britten Centenary. London, Faber. ^ Moskowitz, D. (2010) The Words and Music of Jimi Hendrix. Praeger. "Why is the Augmented 4th the "chord of evil" that was banned in Renaissance church music? ", Guardian.co.uk.